Whether you're a new gamemaster or a seasoned vet looking for a new angle to shake up your game, these 19 essays by expert gamemasters help construct your campaign from the ground up�and keep your players engaged until the dramatic conclusion. 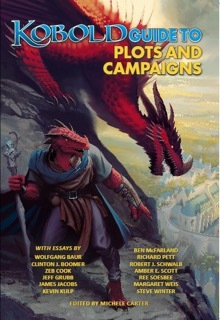 Kobold Guide to Plots & Campaigns shows how to begin a new campaign, use published adventures or loot them for the best ideas, build toward cliffhangers, and design a game that can enthrall your players for month or even years. Want to run an evil campaign, or hurl the characters into unusual otherworldly settings? Want to ensure that you're creating memorable and effective NPCs and villains? We've got you covered. Complete with discussions on plotting, tone, branching storytelling, pacing, and crafting action scenes, you'll find all the tips and advice you need to take on the best role in roleplaying�and become an expert gamemaster, too! Featuring essays by Wolfgang Baur, Jeff Grubb, David "Zeb" Cook, Margaret Weis, Robert J. Schwalb, Steve Winter, and other game professionals.